This is a flexible sewer hose for use with sewer nozzles. It features a smooth surface cover which allows easy access through drain pipes and sewer lines for flushing debris. The durable thermoplastic construction the hose is made from is flexible and lightweight for cornering around line elbows. Water Cannon has a number of options when it comes to drain cleaners. For example, you can turn your pressure washer into a professional drain cleaning system with this durable, easy to use drain cleaning jetter kit. This easy to operate jetter kit will turn your pressure washer into a professional drain cleaning system. 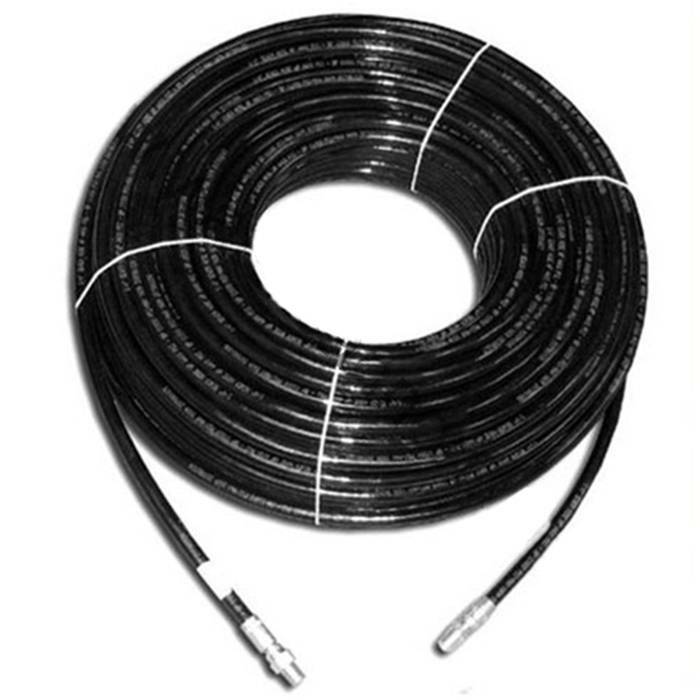 Simply connect the hose and nozzle to the end of the wand assembly (sold separately) and feed the hose down the drain, pipe, etc. Pulsation is achieved by opening and closing the trigger gun. The durable thermoplastic jetter hose this set comes with offers stiff parameters so the hose can be pushed up a line but still bend around elbows. Featuring a sleek, smooth surface, this abrasion resistant hose is available in lengths ranging from 50 to 300 feet.